Multiple Sclerosis (MS) is an autoimmune disorder where the body’s own defenses begin to attack the brain. MS has long baffled scientists as to how the disorder arises, but new research from the University of Toronto is beginning to unravel the mystery. The findings revolve around what are called “tertiary lymphoid tissues” (TLT) that form in the outer layers of the brain (meninges) in MS patients. The appearance of TLTs has often been associated with the progressive brain inflammation that characterizes MS, but until recently no one was really sure what caused their appearance. As it turns out, the culprit lies in “stromal” cells, a type of cell that forms connective tissue throughout the body. The researchers noticed that stromal cells were beginning to form nets of fibers along the meninges and that these nets were attracting T-cells from the immune system. While this is normally a good thing, autoimmune disorders like MS result in T-cells responding to healthy tissue as threats. The T-cells attracted to these stromal nets triggered an inflammation response just like that found in MS cases. Additionally, the presence of the T-cells appeared to further influence how the stromal net was formed. The resulting structure was highly similar to normal lymphatic tissue, creating “pooling points” for the immune system that could further contribute to MS. The researchers used animal models in their study and were not able to identify the root cause of why the stromal cells or T-cells behaved in the way they did. 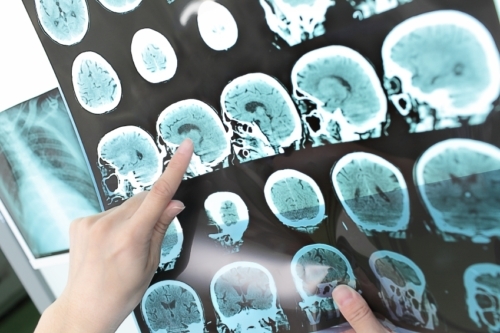 However, their findings have helped narrow the focus in identifying the cause of MS. With additional research, such as into targeted T-cell blockers, new treatment options may even be developed. Multiple Sclerosis is a degenerative disorder in which the body’s immune system attacks the brain and begins to strip the protective lining from nerves. It can cause numbness, weakness, loss of vision (partial or full), joint pains, tremors, slurred speech, fatigue, and bowel and bladder difficulties. The condition affects twice as many women as men. “Multiple Sclerosis,” Mayo Clinic web site, October 1, 2015; http://www.mayoclinic.org/diseases-conditions/multiple-sclerosis/symptoms-causes/dxc-20131884. “New Step toward Determining the Cause of MS,” EurekAlert! web site, December 15, 2015; http://www.eurekalert.org/pub_releases/2015-12/uot-nst121515.php. Pikor, N., et. al., “Integration of Th17- and Lymphotoxin-Derived Signals Initiates Meningeal-Resident Stromal Cell Remodeling to Propagate Neuroinflammation,” Immunity, no. 6 (2015): 1160-173. doi:http://dx.doi.org/10.1016/j.immuni.2015.11.010.